After retirement I resumed my childhood hobby of hand-making electronic appliances such as radio receivers and stereo amplifiers. When I was indulging in hand-making electronic appliances for the purpose of making my amateur ham shack at the beginning of the 1960s, the transition from vacuum tubes to semi-conductors was taking place and the first trials to make integrated circuits were being made. Although I gave up becoming an engineer upon the advice of my class teacher due to my color-blindness, and went on to the law faculty, I did not lose my interest in natural science, in particular electronic engineering. When internet became popular in the mid-1990s, I started to learn computer and networking and made my own websites. But, the virtual world could not fully satisfy me, because I am very much fond of handicrafting tangible things. Finally, retirement gave me enough time for this time-consuming hobby. Now I am at the first stage of catching up the vast technological development which has taken place since I gave up my hobby some 50 years ago. Therefore, I am not sure whether I should immediately start ham-radio and emit radio waves by using my own hand-made transmitters, because insufficient knowledge about electronic engineering might cause various technical mistakes and lead to troubles with neighbors. I also have space difficulties for building short wave antennas for popular frequency bands such as 3.5MHz and 7MHz, as my house does not have enough land to build a full scale dipole antenna for these frequency bands. Therefore, I decided to study the basics of transistor utilization and make stereo amplifiers and radio receivers first. My favorite transistors with leads: the endangered species.. It was rather shocking for me that transistors, which were new inventions and a symbol of high-technology when I got to know them in the early 1960s, became obsolete now, because ICs have drastically advanced in the meantime. Vacuum tubes are still available, because they somehow hold legendary position among some kinds of musicians and audio lovers. However, transistors with leads, which are suitable for hobby hand-making, are more and more scarce in the market, and the literature related to the analogue transistor circuits is hard to obtain, because they are not much demanded. Young people are now more interested in computer programming than in soldering transistors, resistances and other parts into circuits. And for such hobbies as constructing humanoid robots, IC and computer programing are indispensable, but no transistor is asked for. Despite of such unfavorable situation, there still exist electronic parts shops in Akihabara. Many people might believe that Akihabara is the Mekka of manga and anime "otaku". They are nowadays certainly the most powerful group in Akihabara and the next to them are computer "otaku". However, electronic-handicraft "otaku" and amateur hams are not extinct. There are still shops which are specialized in their needs. Akihabara Radio Center and Tokyo Radio Depart (Tokyo Radio Department Store Shops) are still there, though with a reduced number of shops. A bit far from the JR Akihabara Station, Akizuki Denki Tsusho and Sengoku Densho have their shops in the side alley and they are always full of young and old customers. A relatively new-comer Marutsu Elec also has one of its shops in the same area. If you want to find pars of matched f transistors or FET, Wakamatsu Tsusho has always special offers, and Aitendo offers cheap products from Chinese factories. 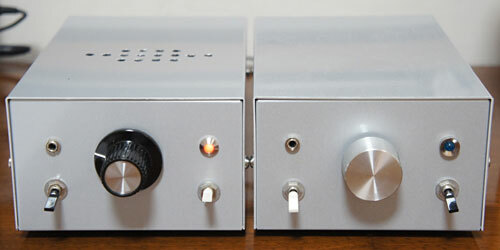 My first amplifier (right) and the second (left). Though they look like similer, the second one has a much higher performance. Inside of the second amplifier. I feel as if I were in paradise, when I stroll through the alleys in Akihabara in daylight or in the evening twilight. It is a thrilling feeling similar to that which ladies might feel when they stroll in the side alleys in Paris where there are elegant boutiques. The nearby shops are filled with miraculous products which are awaiting you. When I was a schoolboy, the cheapest transistor for low frequency purposes such as 2SB110 cost 100 to 110 yen. 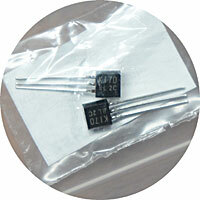 Now, transistors with much better performances such as 2SC1815 are priced at mere 5 yen (four US cents!). Compared with such key semiconductors, good looking aluminum volume knobs cost 1,000 yen or more. It is ironical that low-tech products are more expensive than high-tech products which are essential for the functioning of electronic circuits. Anyhow, I am now grown-up and have much more pocket money compared with my childhood. Also, I do not have to study as student and can do what I want for 24 hours. So, needless to mention, I am now living in a paradise. My first work is a small amplifier power or my B&W speakers. It was OK, but the sound quality was not enough. After 4 months' time, I intensively studied the textbooks for designing amplifier circuits and my second amplifier was completed just 10 days ago; its sound is really perfect for my ears! The first amplifier had two stages; the NPN first transistor with common-emitter for voltage amplifying and the two final stage NPN transistors are connected in an SEPP emitter follower configuration. It was not equipped with negative feedback and decoupling capacitors were necessary at its input and output, its. Therefore, frequency and distortion characteristics were not particularly good. For my second amplifier, I used a differential amplifier with current mirror load and constant current circuits. Its driver is a PNP transistor with common emitter. For the final stage, I used inverted Darlington circuit. For power supply, I used positive-negative dual power circuit so that the potential of audio input and output became zero, which dispensed coupling capacitors. 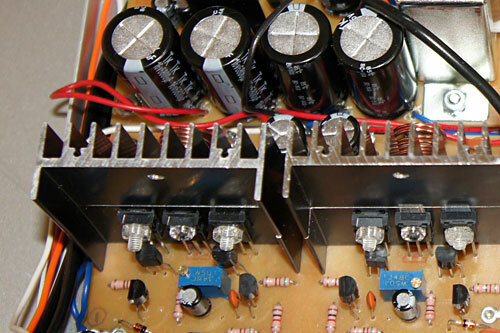 Different sections of the amplifier were decoupled by using small resistances and large capacitors. I also integrated a strong NFB circuit. As a result, its sound became very rich and clear. Parallel to the audio amplifier, I also constructed a small MW super-heterodyne radio, which is a trial before tackling the high-performance SW receiver. After several months' trial and error with electronic handicraft, I got to know Akihabara and its shops more than ever and got accustomed to the designing of transistor circuits and the manufacturing of printed circuit board. I now try to build a frequency counter and a dip-meter. Then, high-performance SW receiver is within my shooting range.